The Starter Kit: Blinkenlights is a huge, freely programmable display. 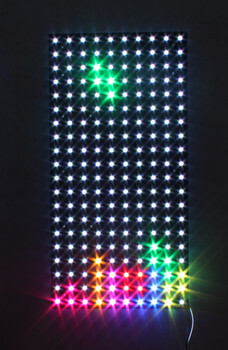 It consist of 200 independently controllable full-color RGB LED pixels that can be changed up to 100 times per second. Possible applications are vast. The kit can be used to create party games, exhibition presentations, fancy mood lighting and custom displays of any kind. The basic kit comes with one Master Brick, one LED Strip Bricklet, four 50 LED Pixel sets, one LED power supply, four wall mounting plates, one perforated board, one front panel and all necessary cables and mounting materials. The basic kit can be controlled over USB by any (Embedded-) PC (e.g. Raspberry Pi), laptop, server or tablet. 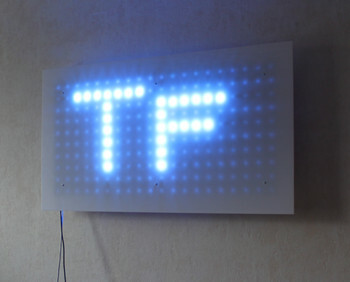 The kit can be extended by other Tinkerforge products. In game applications the Giant Game Pad can be used for controls. 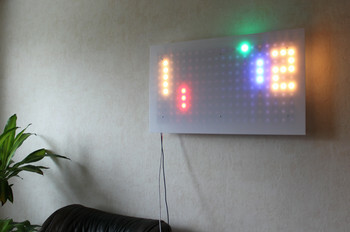 The Piezo Speaker Bricklet can provide background music and the Segment Display 4x7 can show a score. It is possible to play pong with two Dual Button Bricklets. With the Ethernet Extension the USB interface can be changed to Ethernet, to allow smart phone or tablet controlled applications. 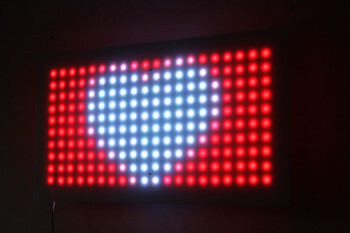 A larger display can be created by attaching more LED Pixels to the kit. 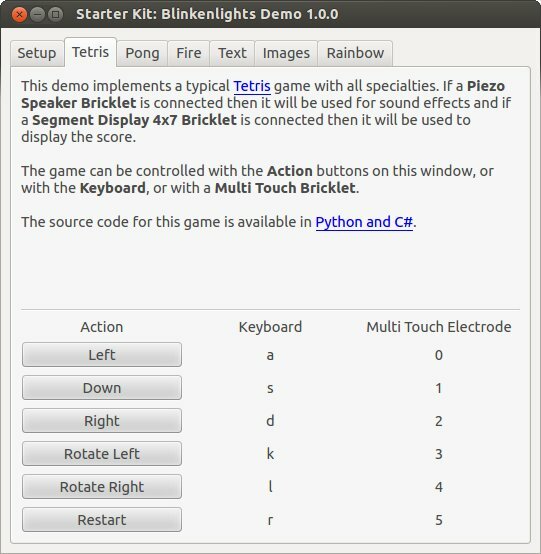 A demo application implements clones of Tetris and Pong and includes different non-game applications. For example, it can show customizable scrolling text in different colors on the display, it shows rainbows, customizable image sets with configurable durations and can warm your heart with a virtual fire. 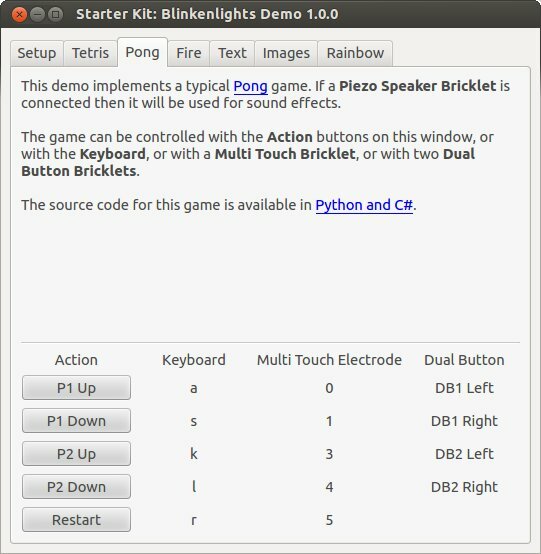 The games can be controlled by a PC keyboard but can be also be controlled by customizable touch pads when using the Multi Touch Bricklet (Giant Game Pad) or by Dual Button Bricklet. 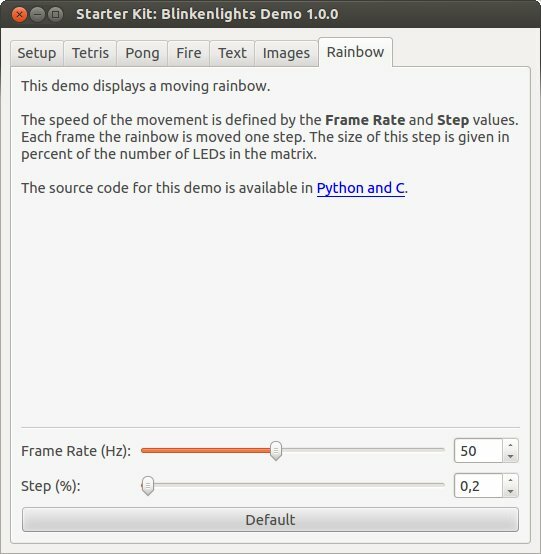 The kit name "Blinkenlights" is used in hacker jargon to describe blinking lights of network equipment. It is also known from the Project Blinkenlights. 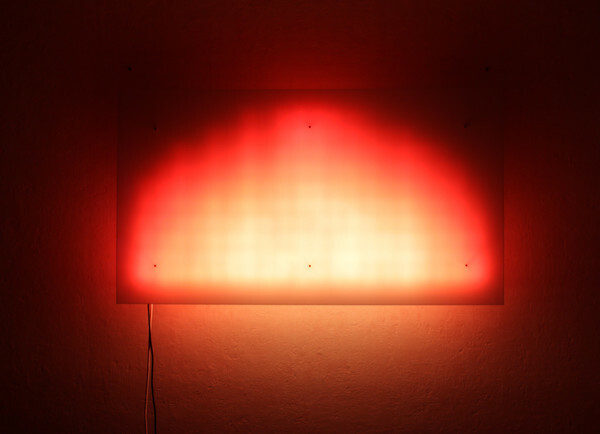 As the next step test the LED Strip Bricklet and the pixels as described here. After that you can start to assemble the kit. The construction is described here in detail. The demo application shows possible use cases for this kit. It consists of 6 individual applications each also provided as individual project (see below). 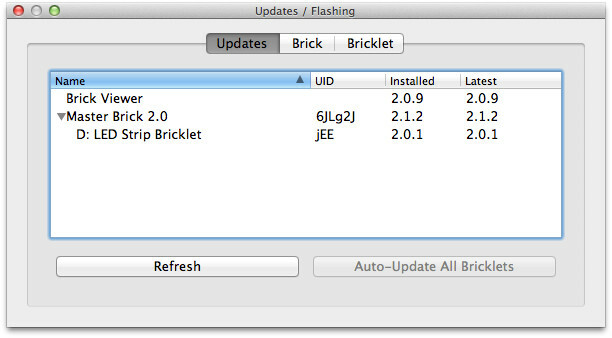 Each project is represented by its own tab and will be started by selecting the corresponding tab. The application supports the additional usage of two Dual Button Bricklets or one Multi Touch Bricklet to control the games. 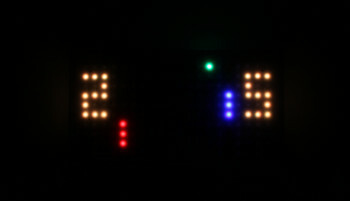 If a Piezo Speaker Bricklet and/or Segment Display 4x7 Bricklet is connected, these Bricklets will also be used by the games to give acoustic feedback or to display the score. Before starting you have to configure the host and port. If you use the standard kit and have connected it directly to your PC via USB "localhost" and "4223" is fine. 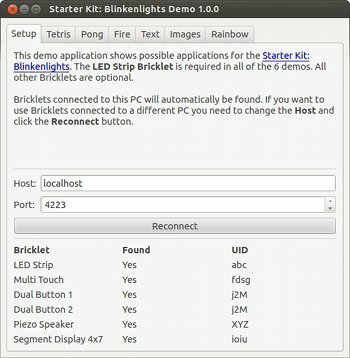 If you extended the kit by Extensions or want to control the kit from another PC you have to enter the IP address or hostname of the Extension or the PC where the kit is connected to. 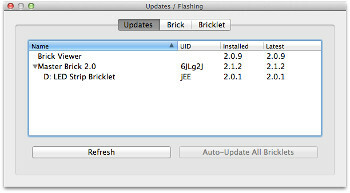 Below the input boxes is a table which shows you the connected Bricks and Bricklets. This Tetris clone can be controlled by three possible ways. Firstly, there are buttons in the tab which can be used to control the game. Next you can use your keyboard. The keys are defined in the tab. 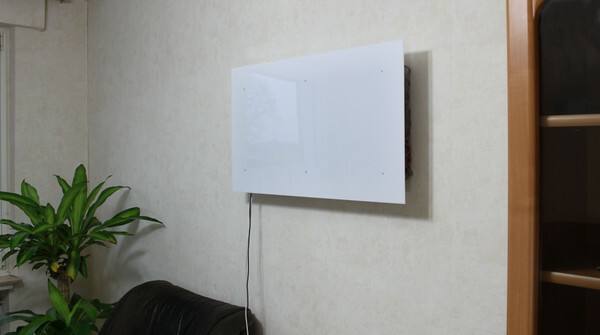 Finally a connected Multi Touch Bricklet with a Giant Game Pad or self-made electrodes can be used. The standalone Python project can be downloaded from GitHub. 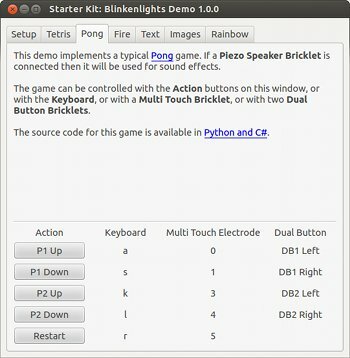 This also incorporates the Pong project and consists of mainly two files: tetris.py implements the game and config.py defines the configuration (host, port, UIDs, LED matrix layout and keymaps). There is also a C# implementation that can be downloaded from GitHub. Like Tetris the Pong can be used with or without front panel. The following images show pong with darkness and daylight. 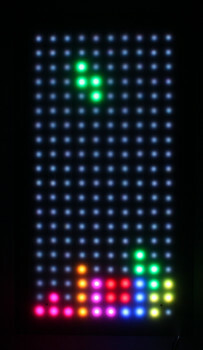 The game can be controlled by buttons, keyboard or a Multi Touch Bricklet. Additionally it can be controlled by two Dual Button Bricklets. The standalone Python project can be downloaded from GitHub. 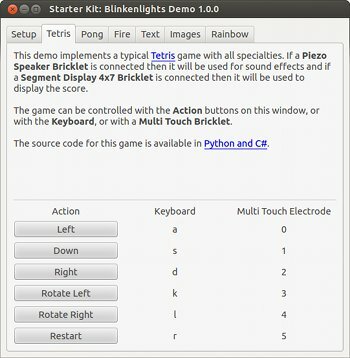 This also incorporates the Tetris project and consists of mainly two files: pong.py implements the game and config.py defines the configuration (host, port, UIDs, LED matrix layout and keymaps). When selecting the Fire tab you will see a fire simulation. It looks good if you place the front panel in a distance of 42mm (2x9mm and 2x12mm standoff) to the back panel. 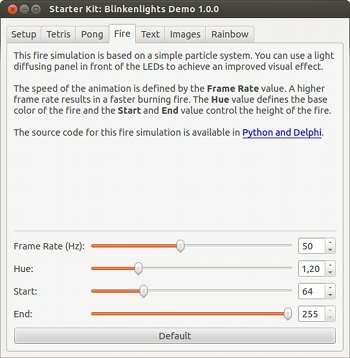 The following images show the fire simulation during darkness and daylight. 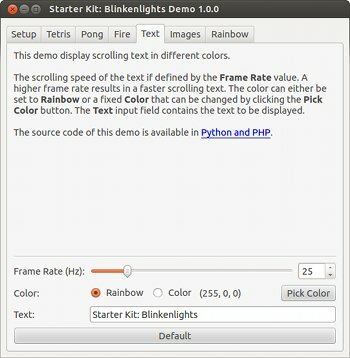 Frame Rate: Defines the frame rate in Hz. The simulation is updated for each new frame. If you increase the frame rate you will see a faster burning fire. 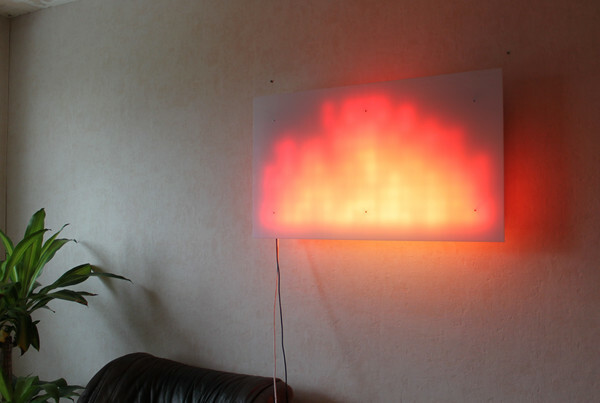 Hue: Defines the color of your fire. Start: Defines the starting point where the fire particles will start to rise. End: Defines the end point where the fire particles will extinguish. Play with the sliders to configure your personal fire! With the "Default" button you will set back all sliders to their default values. The standalone Python project can be downloaded from GitHub. It consists of mainly two files: fire.py implements the simulation and config.py defines the configuration (host, port, UID, LED matrix layout and simulation parameters). There is also a Delphi implementation that can be downloaded from GitHub. The "Text" demo will scroll the entered text with the given frame rate on the display. The text moves one column per frame. A higher frame rate results in faster moving text. You can set changing colors by selecting "Rainbow" or select "Color" and pick the color you like by pressing the button. The standalone Python project can be downloaded from GitHub. It consists of mainly two files: text.py implements the logic and config.py defines the configuration (host, port, UID, LED matrix layout and color parameters). There is also a PHP implementation that can be downloaded from GitHub. The "Images" demo can be used to display user specific images and whole animations. Choose the images you want to display by pressing "Choose Images...". 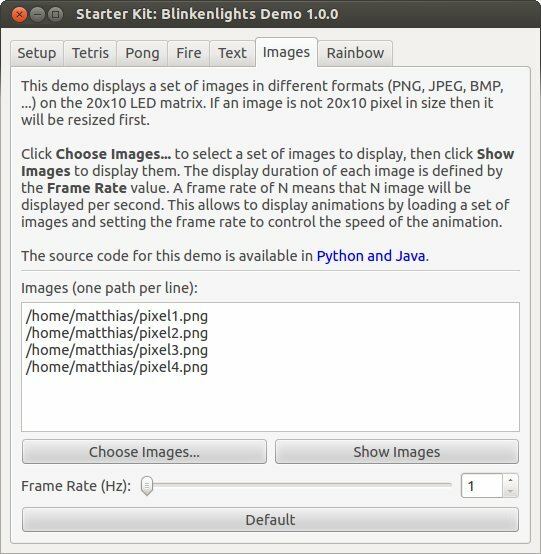 The application will display the images with the given frame rate and switch to the next image in the sequence each frame. This way you can create animations. Each image is resized to 20x10 pixel (size of the display) and stretched if the aspect ration does not fit. Use an image editing tool if you are not satisfied with the results. The standalone Python project can be downloaded from GitHub. It consists of mainly two files: images.py implements the logic and config.py defines the configuration (host, port, UID, LED matrix layout). There is also a Java implementation that can be downloaded from GitHub. 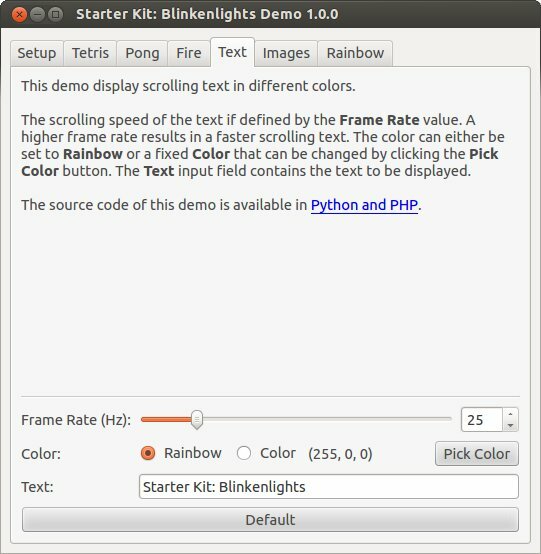 The "Rainbow" demo will display a moving rainbow with the given frame rate and speed. The results depend on the distance to the front panel. The following image shows the rainbow demo with 12mm distance in daylight, 42mm distance in daylight and with 42mm distance during darkness. A higher frame rate and speed results in faster moving rainbow. The standalone Python project can be downloaded from GitHub. It consists of mainly two files: rainbow.py implements the logic and config.py defines the configuration (host, port, UID, LED matrix layout and speed parameter). There is also a C implementation that can be downloaded from GitHub. 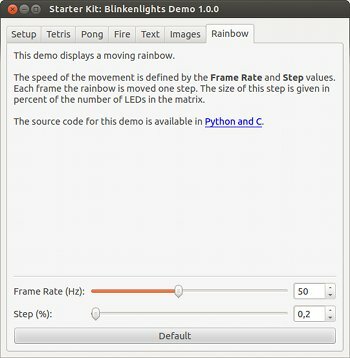 If you modded, extended or improved your Blinkenlights installation in any way and you have published your results on our Wiki, on your blog or similar: Please give us a notice. We would love to add a link to your project here!